It's all knitting this week. I'm on the second sock of a pair for DD1's Christmas pressie, and have to admit I prefer working on dpns, rather than like this, on two pins, because of all the sewing up involved. The yarn is lovely, though - really soft, and a more delicate colour combo than that picture shows. 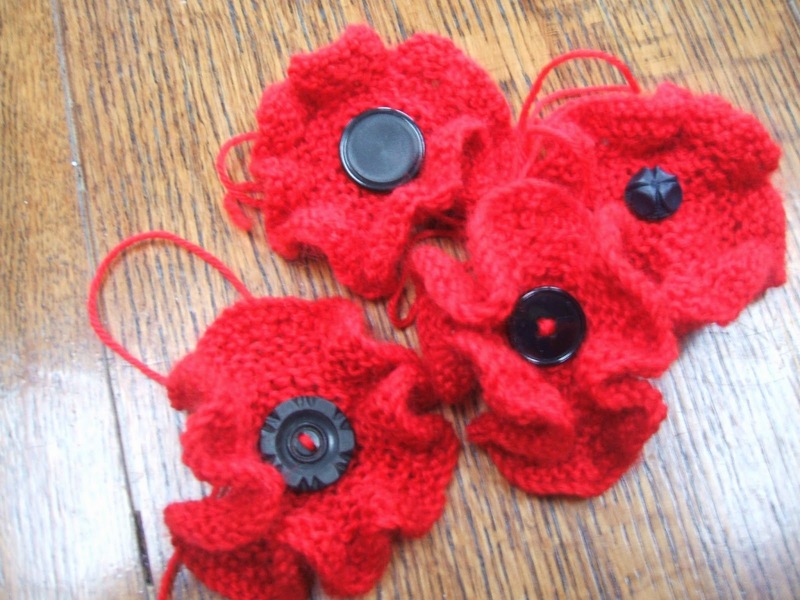 The other WIP are poppy brooches, ready for sale to help the British Legion, on Remembrance Day. This year sees the 100th anniversary of the Battle of Gheluvelt where 187 of 380 brave, young local men lost their lives. Our lovely, local park commemorates that battle. That's it for now, cos I need to get cracking with Mum's tea. I'll see you over at Julia's, over the next few days. Not familiar with WOYWW? Click the button on my side bar to pop over and join the fun. Love the socks! Could use some of them right now, my basement is freezing as we are still adjusting to the colder nights and it is not quite time to turn up the furnace yet. Nice to see the socks! Now, I'm wondering how you sew them up ... is it just one seam down the back? Love those Remembrance poppies, so gorgeous. The black buttons in the middle really set them off. Is there a pattern you can direct me towards? I'd like to have a go myself. Love those warm looking socks too, though that's something I will never try! I love the colour of those soaks, bet they will keep your daughter as warm as toast. The poppy brooches are beautiful and will be worn with pride I'm sure. Such pretty socks!! That's such a lush color!! :) I loved the poppy brooches too! 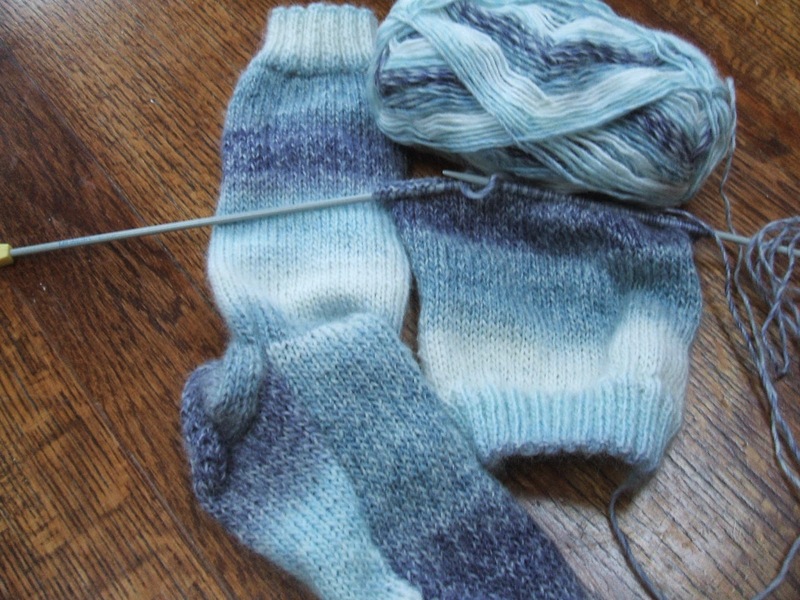 Lovely socks - I really like the soft subtle shades of the wool. I bet your daughter will love them. I like the poppies - that's a lovely idea for Remembrance Day. Lovely socks! But I particularly like your poppies. Beautiful they are. I saw on FB the other day the photos of the veterans and a sea of poppies near (I think) the Tower in London. But it was a SEA of poppies. Never seen anything like it. That WWI was a horrible one and needs to be remembered. Thanks for calling by at mine earlier. That sock wool looks fab.... love the colours. Love the poppies you've made too. Love the socks but the poppies are even better. Chris those socks look gorgeous, so soft and cuddly, and the poppies are brilliant. Thanks for visiitng my desk and your lovely comments, but I do feel guilty now for getting everyone's tummies rumbling, sepecially at teh thoguht of marmalade cake which I didn't make in the end, made chocolate instead. Gorgeous socks...may I have some purpley coloured ones please? No? Ok then! I thought I would try. Your poppies look gorgeous too. Thanks for stopping by my blog and saying hello, I really love your poppy brooches what a great idea especially as it honors the fallen war heroes of yesterday. The soft colors of your sock project and the bright red of the poppies are perfect colors! Happy WOYWW! Thank you for dropping by! Those socks look lovely and snugly to wear for the cold days we are having now! Those socks will be cozy. Thank you for the lovely comment you left on my blog, Chris! I'm hopeless with knitting needles (or any kind of needles for that matter!) so I'm in awe of people who can do this! Have a crafty weekend! zsuzsa @ InkyDinkyDoodle PS. I'm not sure if it was you last week, but a Chris left a comment on my blog and I couldn't return the visit because they forgot to give me their number and I couldn't find them! If it was you, I'm so sorry! 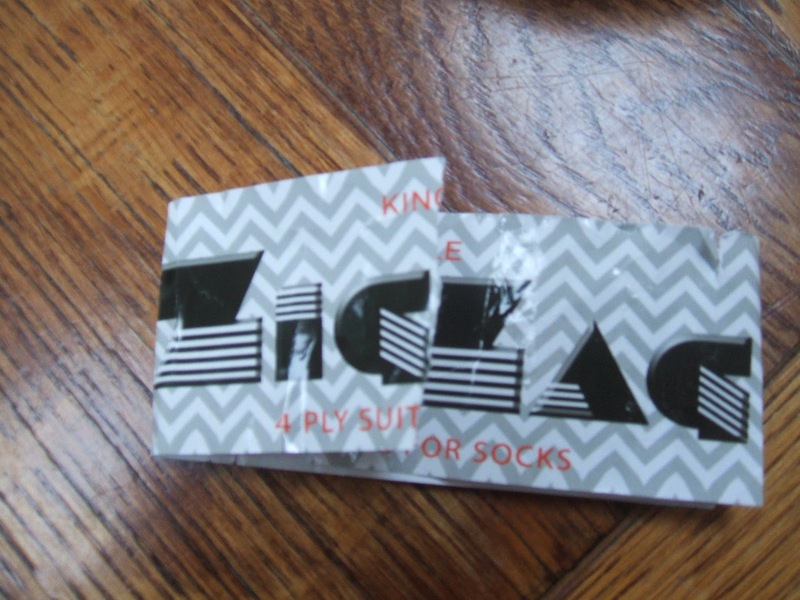 Excellent socks, love the colour but I wouldn't want to be seeming them at all! The poppies are so pretty and I love your local park. You should join Ravelry is you haven't already, more free sock patterns than you can shake a stick at! I love the yarn you are using for the socks, Chris. It looks so pretty, and also nice and soft! Also your gorgeous poppies - what a great idea. So nice to have poppies that last longer than the paper ones. 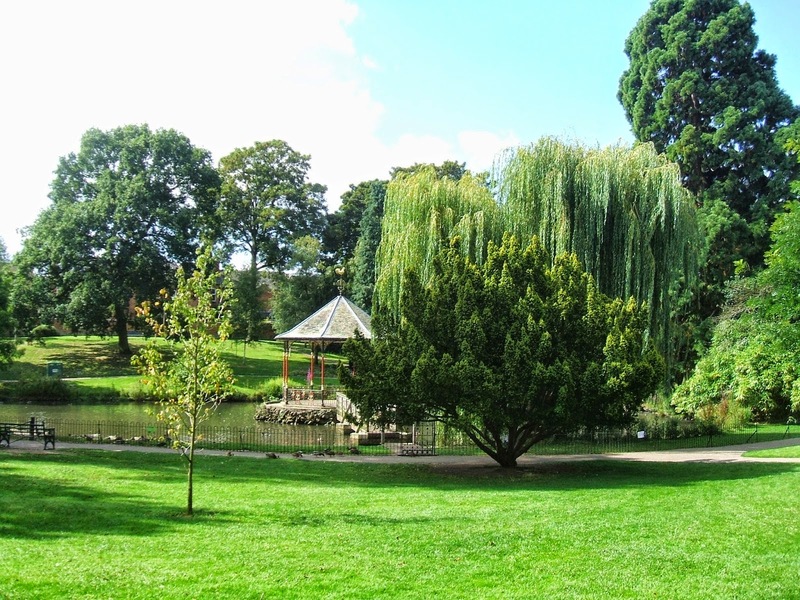 Your local park looks so lovely, and what a great memorial. I shall be wearing my felt poppies of Remembrance Day! I have now attached them to a hair clip and put some pretty gold beads in their centres. Photos to follow very soon! Thanks for your visit and your nice comment. I agree it's great when we can share info! I'll be blogging about the Ampulla stuff when it arrives (hopefully very soon). Super socks, what a great gift that will be--the yarn looks wonderful. Your poppies are a sweet remembrance, those are sure to sell well! Thank you for stopping by this woyww, Chris! Love the color of the socks. Knitting terms are way over my head but love seeing what others do! The park is beautiful! Thanks for popping by and happy belated WOYWW! Hi and thanks for the visit. Love the soft cuzzy socks. The poppies are fab and will go like crazy! I do like your socks, your daughter will love them I can't get on with 4 needles and so those that can I am impressed. Thank you for your visit to my desk. Those socks look so lovely and warm and your poppy brooches are really lovely, hope you raise lots of money. I have taken to each year buying a brooch from the British Legion as I always lose the paper poppies, this year I have treated myself to one of the really sparkly ones to go on evening wear.